Full of green veggies, soft mozzarella & fresh herbs, this bright spring salad recipe is a delicious, yet simple showcase of spring's best produce. This salad is spring on a plate! Blanched asparagus gets tossed with sweet basil oil, peas, radishes, chickpeas, and pistachios. I balanced the crisp veggies with creamy mozzarella, although sliced avocado would be equally delicious in this spring salad if you’re vegan. Like most green salad recipes, this one is totally flexible. For extra crunch, try roasting the chickpeas. If you don’t have pistachios on hand, pine nuts or walnuts would be equally good. Blanched broccolini or snaps peas would be great alongside or instead of the asparagus and peas, and you could use watermelon radish in place of red radishes. And if basil or mint isn’t your thing, try substituting dill! This is a great make-ahead salad – perfect for your spring picnics & brunches. The veggies will stay crisp overnight in the fridge, just add the salad greens as you’re ready to serve. Make sure to try this grilled asparagus salad, this kale salad, and this broccoli pasta salad too! This bright spring salad is a celebration of green veggies! Crisp asparagus, peas, and radishes contrast perfectly with soft mozzarella and an herbed vinaigrette. 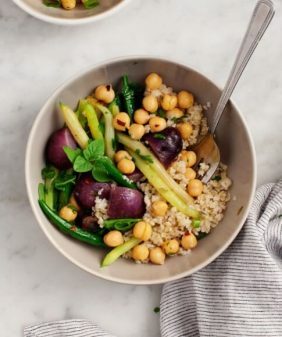 A great vegetarian dinner side or lunch. Make the basil & mint oil: In a food processor, pulse together the herbs, garlic, lemon juice and zest, balsamic, olive oil, and salt and pepper. Taste and adjust seasonings. Set aside. 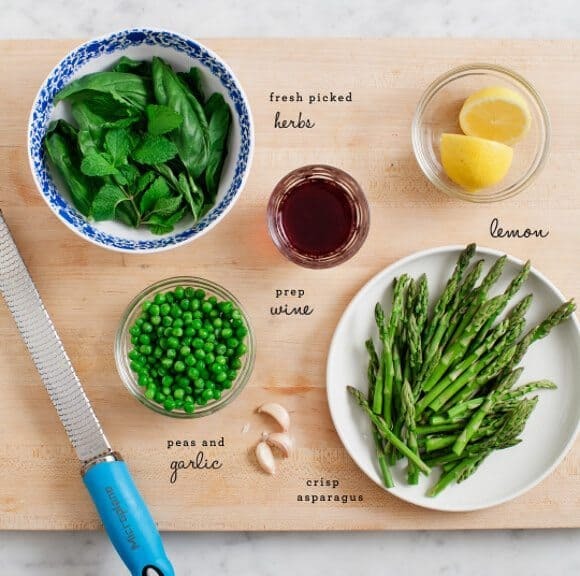 Prepare the salad: Chop your asparagus into 1-inch pieces. Blanch them for about 45 seconds in a pot of boiling, salted water. Remove immediately and transfer asparagus to a bowl of ice water. Let cool, then drain. (If you’re using fresh peas, blanch the peas as well, if you’re using frozen ones, just let them thaw and add them to your salad raw). 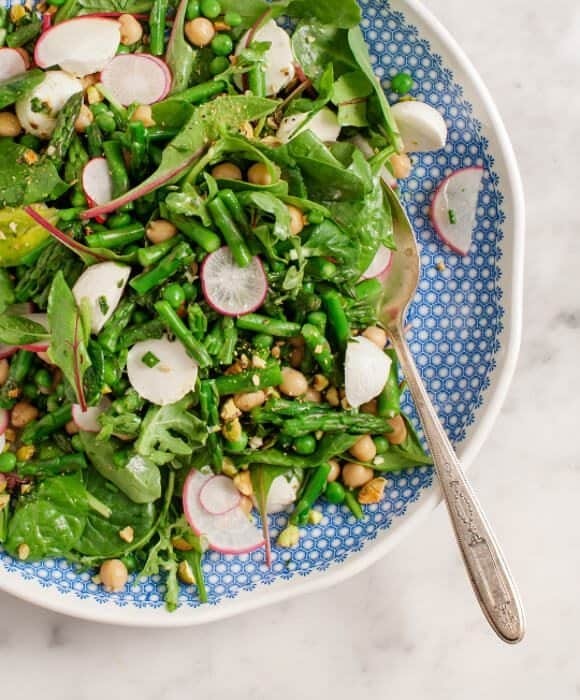 In a large bowl toss together the blanched asparagus, peas, salad greens, chickpeas, radishes, and mozzarella. Add as much of the dressing as you like and toss again. Add the pistachios, chives, and mint. Taste and adjust seasonings. Transfer the salad to a platter and serve. 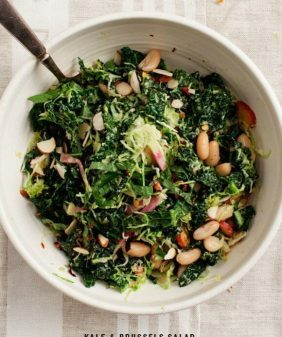 This salad can be made up to a day in advance, just leave out the salad greens until you’re ready to serve. Blue and white is just such a beautiful color combination for anything kitchen related! This looks positively dreamy. I wonder if it’d be good with a dollop of hummus in place of the chickpeas. Nothing gets on my nerves like trying to eat a chickpea with a fork. you can leave the chickpeas out :). Sub in another protein or whatever you like! Ugh I’m already addicted to kitchenware so being introduced to a new place is such bad news…the basil and mint oil dressing sounds intriguing! The perfect summer salad, yes indeed! 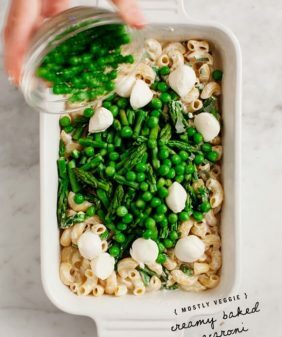 You had me at asparagus, though I love the addition of pistachios also, yum! This looks great! I love green peas in my salad – they’re my favorite addition! Yum! This salad make me miss summer in Aussie. Those bright green and blues of that beautiful plate makes this the perfect salad. What fun patterned plates. And I’m loving your basil and mint oil and pistachio addition. I never think of making salads ahead but this really is the perfect one for it. 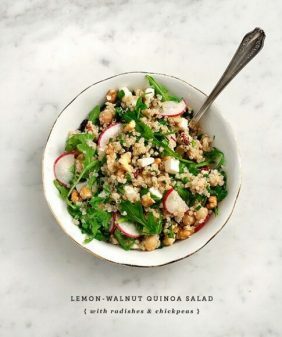 Love this salad and am going to make it next week!! Thank you! So many good salads from you lately! All gorgeous, and this one makes my mouth water! I’m obsessed with salads (good hearty ones)! Such Spring perfection, my heart sings! Very excited about that dressing too, what a wonderful idea! I love all of these colors. 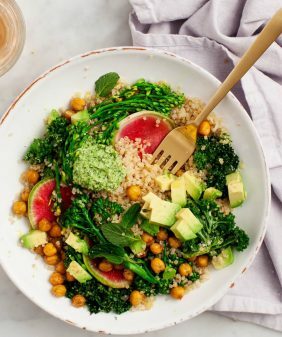 I am pretty sure I would feel super healthy after eating a bowl of this salad. Love peas in salad. This look so good. This is simply salad perfection. 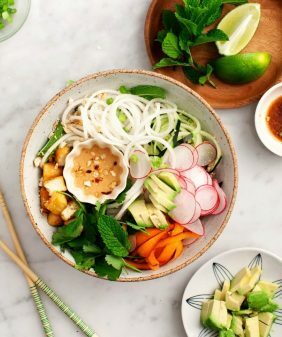 Love the pictures and the salad looks really beautiful on that dish. So great, thanks! This is my kind of salad! The vibrant colors look stunning against the dinnerware. Ha, prep wine is an important part of every balanced diet! This kind of salad is exactly what I want to be eating right now. Really beautiful – just the colors of a perfect spring day. I’m so hungry for green things! I find myself getting excited each time i visit your website! And with each recipe i say i can’t wait to try this… thx for being passionate about your food and sharing. This recipe like them all seems like a winner. Oh, love those blue plates! So pretty. The salad is gorgeous, too! I’ve been putting radishes in everything lately. Made this tonight for dinner with farmers market veggies and it was so, so good! Definitely going into our dinner rotation while the veggies are in season! One of the best salads ever. I used both Mozz and avocado and skipped the chick peas. Forgot to buy basil so used pesto. Perfect salad for our community Mother’s Day dinner! You can toss it with the dressing, the asparagus, etc, will stay plenty crispy, but the greens would become soggy. (Or you can wait to add the dressing at the end, that’ll work too). I can’t tell you how much I love your site. As a foodie… as a photographer, as a graphic designer AND as a wordpress fanatic… you are hitting all my buttons! Love your recipes (after living in Istanbul for 2 years and Spain for 15 I put lemon juice on everything too) such variety! And, as a “pescatarian”, (I don’t eat land animals – I eat fish though…) your site delivers time after time. This is a beautiful and tasty salad. However, the photo was taken with no dressing on the salad. Just FYI. I made this for Easter lunch yesterday, and it was wonderful! I had the leftovers for lunch today, and it was even better. This is the PERFECT Spring/Summer salad! Hi. Beautiful salad. Will be making as party of my Easter dinner. Curious how many as written this serves? Hi Jodi – it should serve 4 as a side. Happy Easter! Great – thanks, Jeanine. Happy Easter to you as well! This is honestly such a delicious salad… I knew it from looking at the ingredients. Only thing I did differently is doubled the dressing (because we like it saucy!) and used Boccochini cheese. Fresh herbs from my garden would be the only thing to make this salad better in my opinion but considering we had snow 2 weeks ago I’ll take some good organic grown ones… was such a hit at our Easter dinner! How did you measure the basil and mint in the dressing? I’ll need to double it, too. Approximate amounts? Thanks. Would love to know how to measure the amount of basil and mint for the dressing. Making it for company the first time…..sounds wonderful. Hi Jeanne, about 1/4 cup in the dressing, more can go in the salad itself. I hope that helps!